Trac is a free and an open source Web-based project management and bug tracking system that helps developers to write great software while staying out of the way. You can easily integrate Trac with version control systems like Subversion and Git. 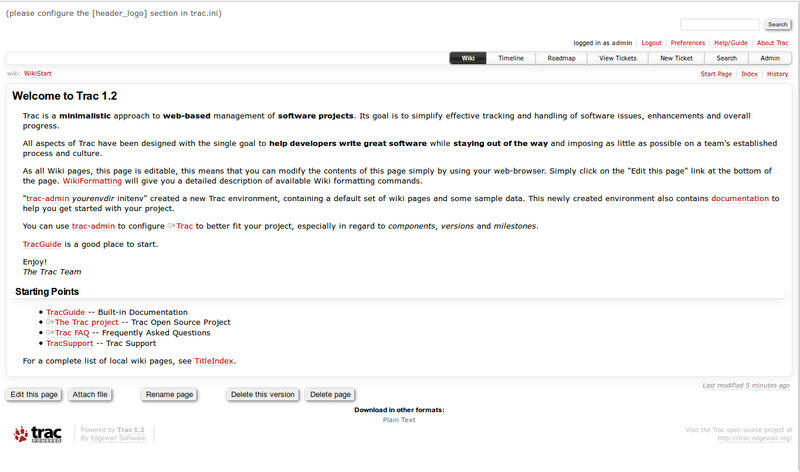 Trac allows wiki markup in issue descriptions and commit messages, creating links and seamless references between bugs, tasks, changesets, files and wiki pages. In this tutorial, we will learn how to install Trac on Ubuntu 18.04 LTS (Bionic Beaver). Project environment for 'test' created. Then point your browser to http://localhost:8000/test. Trac is now installed and configured, it's time to access Trac web interface. This instruction got me further than the trac site. But when I modify the trac.conf file acoording to your instruction the statement WSGIScriptAlias causes apache2 to not restart. Removing this line and all is ok. But I don' get a login in prompt, just a list of files in the test directory. Do you know what I did wrong? I have 2 issues - I cannot get any password from the .htdigest to accept (password prompt keeps coming back) despite resetting password and restarting apache. If I remove auth completely, I get a "forbidden" error from Apache, presumably as it is trying to find a directory. Found a manual way to do this... copy the "/var/www/html/trac/test" directory to a new "test2" directory. It's only 1.5MBytes. /var/www/html/trac/test$ grep -r "test" .